With the Directferries.com Ferries to Langkawi Island guide get all the information you need to plan and book your ferry crossing. We currently offer ferries to Langkawi Island on around 12 ferry routes with a choice of up to 105 sailings weekly. 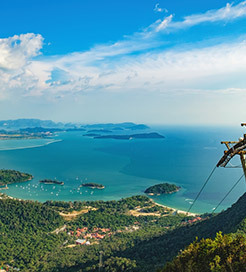 Follow the links of various ferries to Langkawi Island below or to compare timetables and ferry prices now simply enter your details in our 'Fare Search'. For more information, please visit our Ferries from Thailand to Langkawi Island page. For more information, please visit our Ferries from Phi Phi Island to Langkawi Island page. For more information, please visit our Ferries from Penang Island to Langkawi Island page. For more information, please visit our Ferries from Phuket Island to Langkawi Island page.